One of the major difference between the MCB (Miniature circuit breaker) and MCCB (Moulded case circuit breaker) is that the interrupt rating of the MCB is up to 1800 amps whereas the interrupt rating of the MCCB is between 10k – 200k amps. The other differences between them are explained below in details. Definition Type of switch which protects the system from overloaded current. Protects the equipment from over temperature and fault current. Abbreviation Miniature Circuit Breaker Moulded case circuit breaker. Pole Available in single, two and three versions. Available in single, two, three and four versions. Uses For domestic purpose. For commercial and industrial use. The miniature circuit breaker is an electromechanical device which, automatically, switch off the circuit whenever the abnormal condition occurs. It easily senses the overcurrent caused by the short circuit. The working principle of the miniature circuit is very simple. Their main function is to protect the equipment from overcurrent. It has two contacts one is movable, and the other one is fixed. When the current increases from the predefined limit, their movable contacts are disconnected from the fixed contacts which make the circuit open and disconnects them from the main supply. The MCCB stands for moulded case circuit breaker. It is a protecting device which protects the circuit from overloading. It is mainly used in a place where adjustable tripping requires. The current rating of MCCB is up to 2500 amps. It is mainly used for high current applications. The MCCB has a manually operated switch for tripping the circuit. The MCCB has two arrangements. One for the over temperature and the other for the over current. It consists bimetallic contact which expands and contracts when the temperature of the MCCB changes. 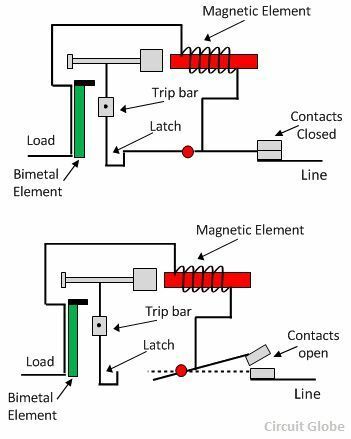 During the normal operating conditions, the contact allows the current to flow through the circuit. But as the current rises beyond the predefined value, then their contacts will warm and expand until the contacts are open. Thus, disconnected the circuit from the main supply and protects the equipment from damage. The MCB is a type of switch which protects the system from overloaded current whereas the MCCB protects the system from over temperature and short circuit current. The MCB stands for Miniature circuit breaker whereas the MCCB stands for moulded case circuit breaker. The tripping circuit of the MCB is fixed whereas in MCCB it is movable. Note: The tripping circuit turn on and off the flow of electrical current. When over current flows through the MCB and MCCB it shuts off the switch and hence protects the equipment from damage. The MCB has single, two, or three pole version, whereas the MCCB has single, two three or four pole version. Note: Pole in MCB is the number of phases uses by the circuit breaker for the switching and protection. The interrupting current of the MCB is the 1800amps, and for MCCB it is 10k -200 k.
Note: The interrupting current is the maximum current that the circuit breaker can interrupt without being disrupted. The remote on / off is not possible in MCB whereas it is possible in MCCB by the use of shunt wire. The rating current of MCB is 100 amps whereas the rating current of MCCB is 10 – 200 amps. Note: The rated current is the maximum current that the circuit breaker should draw. The MCB is mainly used in low current circuit whereas MCCB is used for the heavy current circuit. The MCCB is used for the domestic purpose, and MCCB is used in large industries. The MCB and MCCB both are the thermomagnetic devices and are classified under low voltages breaker..
Its a great article as i’m a beginner and want to know about this difference between. I must say that you have not only explained the difference , but also the importance of mcb and mccb. I loved this article..